SEMA Hall of Fame - Fred Offenhauser, 2014, Offenhauser Equipment Corp..
You might not know that Fred C. Offenhauser had a pet pig named Olive Oil as a child and a poodle named Dolly as an adult. He made Sunday morning breakfast every week for his family. He loved his motor yacht and would cruise to Catalina or along the coast quite often. What you probably do know about Fred C. Offenhauser is that he founded Offenhauser Equipment Corp., and his company was behind an extremely successful line of intake manifolds. Offenhauser parts became synonymous with performance. 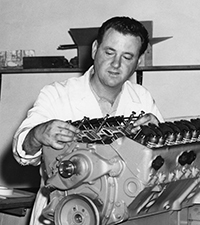 The hardest thing to know about Fred C. Offenhauser is that we lost this industry giant in 1992. Offenhauser grew up on a ranch in Perris, California, before moving to West Los Angeles around 1935, near his uncle Fred H. Offenhauser’s shop, Offenhauser Engineering. Uncle Fred was already well known in the industry for being the designer of the famous Offenhauser four-cylinder racing engine that dominated Indy starting in the ’30s, yet Offenhauser wasn’t born into an automotive environment per se. His father wasn’t much of a car enthusiast, but Offenhauser had a natural gift when it came to machining. 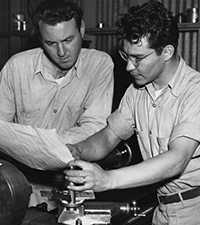 He ended up working for his Uncle Fred as an apprentice machinist, learning about engine design. He then joined the Navy and became a machinist working on blimps until his discharge in 1946 and his return to his uncle’s shop, where he was poised to take over the business. When circumstances prevented that from happening, Offenhauser instead opened his own place, Offenhauser Equipment Corp., which made hot-rod parts. Detroit’s Big Three quickly came calling, with Offenhauser making hop-up kits for Chrysler. 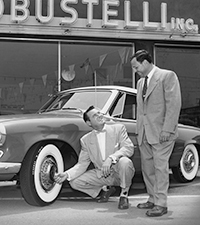 And when Ford introduced the Y-block in 1954, Fred and his team—his brother Carl, who was shop foreman, and chief engineer Ollie Morris—developed innovative intake manifolds. The team was also developing performance parts for the new Chevy V8. But Offenhauser’s ultimate dream was to give the general public high-performance intakes. But that was before warehouse distributors were born. 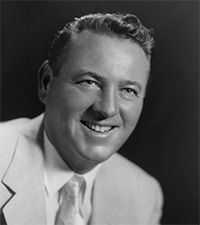 Smith attended one of the only automotive shows in the country in the ’50s before SEMA and the SEMA Show existed. But he got to know Offenhauser in a hotel room after that Chicago show. He was there with a few other future industry heavy hitters, including Vic Edelbrock, and these product sellers and original charter SEMA members would later hold meetings back home in California to talk about who they were selling to who owed them money. “SEMA basically started out as a collection agency,” Bill Smith said, and he joined when the organization invited dealers, jobbers, and warehouse distributors so that a distribution structure could be put into place for the industry. “My dad never talked about being a pioneer,” said Offenhauser’s son Tay.